There isn’t anything better (to me) than freshly baked oatmeal–especially when it’s apple cinnamon flavored. And being able to cook it in the Instant Pot makes my morning so much better. 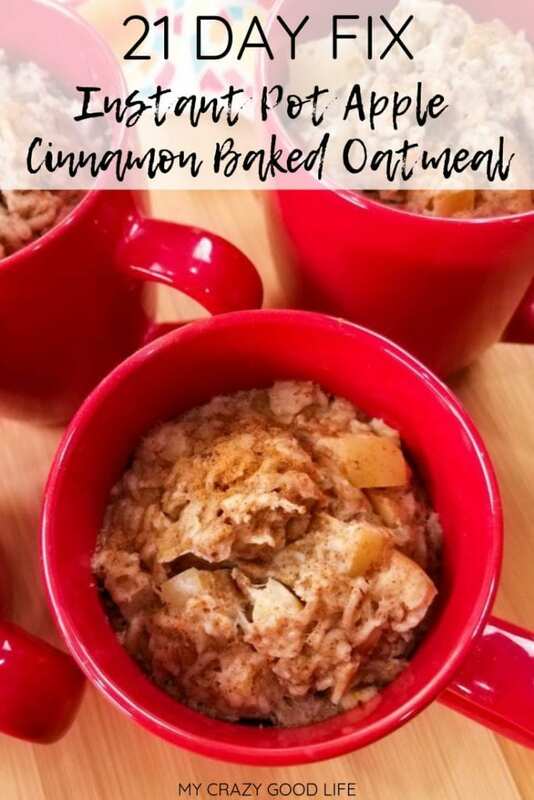 I love the smell of apple cinnamon oatmeal, and love the ease of baked oatmeal–you can eat it now or make a bigger batch and save it for later, and it still tastes the same. 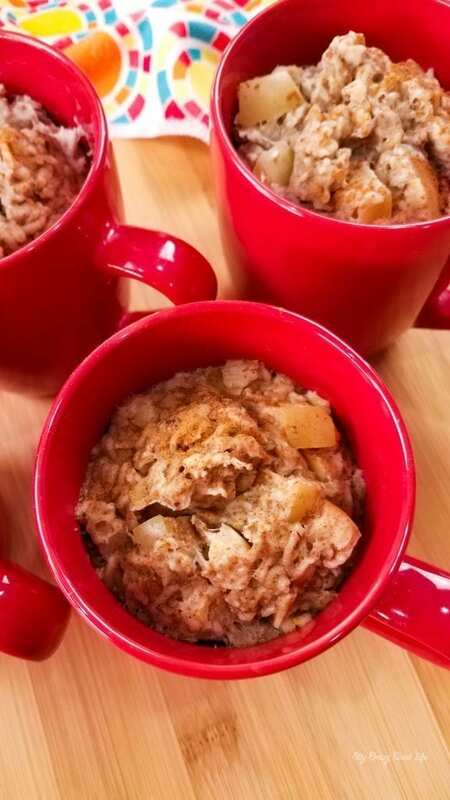 This 21 Day Fix apple cinnamon oatmeal makes the perfect grab and go breakfast. 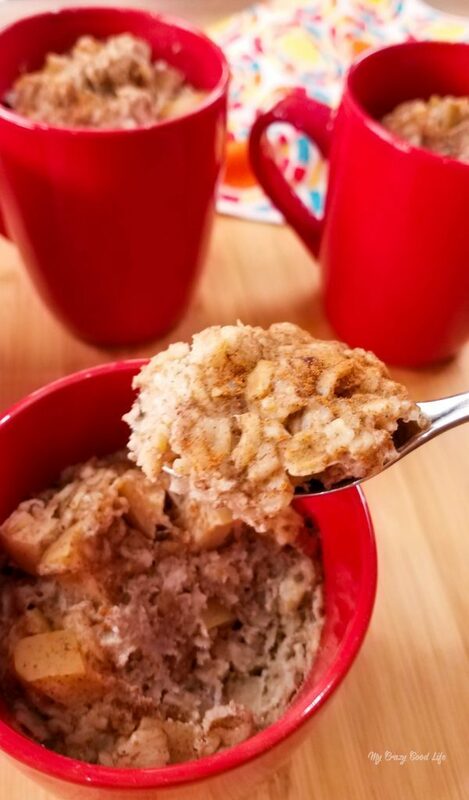 Traditionally baked oatmeal is made in the oven…well the Instant Pot is so versatile that it can do almost anything in the kitchen, including baking! 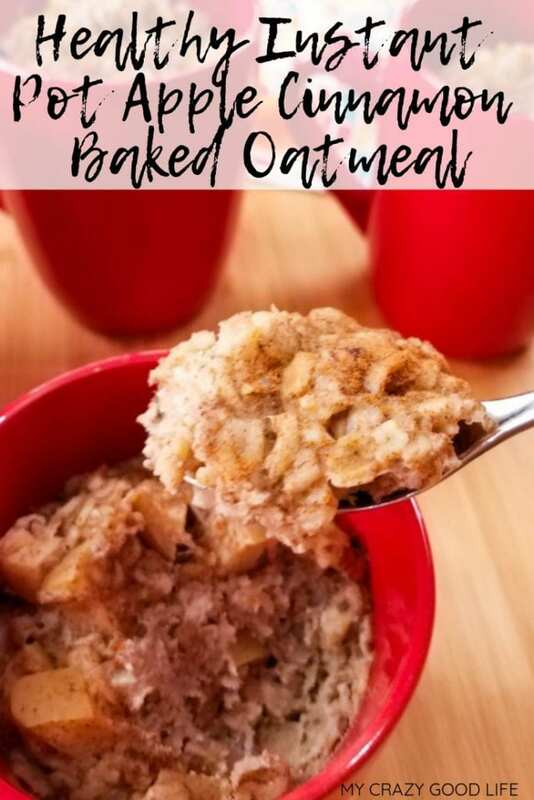 Baked oatmeal involves mixing up your oatmeal recipe and then baking it…It’s simple enough but can be time consuming. The easiest way to cut down on that cooking time is with the Instant Pot! 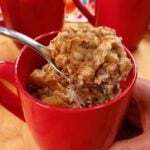 Oatmeal is a heart healthy way to start your day. This particular healthy baked oatmeal recipe is 21 Day Fix friendly as well as Weight Watchers friendly. There are so many great benefits to starting your day with a healthy breakfast, with this easy recipe you’ll love that there’s no extra work involved. Is this a baked oatmeal recipe? Yes! I’ll show you how to make this Instant Pot baked apple cinnamon oatmeal in individual cups. It’s a great way to have breakfast ready to go and already portioned out in serving size cups! 1) Combine all the ingredients in a coffee mug. Mix well so that all of the oatmeal is wet. 2) Add 2 cups water in the Instant Pot insert and place the trivet on the bottom. Place the coffee mug in the Instant Pot and lock the lid into place, closing the pressure valve. My Instant Pot was able to hold 4 coffee mugs. 3) Cook on high pressure using the manual setting for 10 minutes. When the done, turn the Instant Pot off and let the pressure release naturally. Remove the mug from the Instant Pot. Be careful, they will be hot. If yours are not getting down in that time, see this chart for adjustments. 4) Serve while warm, or take with you on your way out of the house. Tip: If you want to be able to pop it out of the mug spray the mug with coconut oil before adding the ingredients. Note: You can also mix the ingredients in a large bowl and pour into the mugs, canning jars, or ramekins. 21 Day Fix container count per mug: 2Y, 1tsp, .5R, and .25P. How many Weight Watchers points is this oatmeal? Combine all the ingredients in a coffee mug. Mix well so that all the oatmeal is wet. Add 2 cups water in the Instant Pot insert and place the trivet on the bottom. Place the coffee mug in the Instant Pot and lock the lid into place closing the pressure valve. My Instant Pot was able to hold 4 coffee mugs. Cook on high pressure using the manual setting for 10 minutes. When the done, turn the Instant Pot off and let the pressure release naturally. Remove the mug from the Instant Pot. Be careful, they will be hot. Serve while warm, or take with you on your way out of the house. Tip: If you want to be able to pop it out of the mug spray the mug with coconut oil before adding the ingredients. Note: You can also mix the ingredients in a large bowl and pour into the mugs, canning jars, or ramekins. 21 Day Fix container count per mug: 2Y, 1tsp, .5R, and .25P. What if I dont have an instant pot ? You can bake these at 350. I’d check after 20 minutes and every 5 minutes after. How are these only 50 calories especially when there’s an egg in it? An egg alone is about 70 calories. Hi Gina! Yes, these aren’t always 100% accurate, which is why I have a note about calculating them yourself if it’s important to you. I’ve recalculated this manually and the nutrition information is correct now :) Thanks for letting me know! Would their be a time change if you used steel cut oats. I am not a fan of old fashioned and just giving steel cut a try, as so many say they prefer. I am looking forward to trying this but cooking in a coffee cup makes me nervous that it would crack or break under this extreme heat. Has anyone had problems with that happening? I considered my glass Anchor Hocking small bowls but it does not say anything about up to what heat. It only says no stove top, microwave safe. I considered ramekins that are oven safe, but only hold 9 oz. Advise on type of coffee cup or other containers others are using please. Along with my question of container material and size for cooking the Apple Oatmeal breakfast, on your site you recommend a 4 oz ramekin. A serving of oatmeal is 1 c. add the apple and egg, it would be a little larger than a cup cooked. This seems like a cooking container that is too small for a serving. Am I missing something? Can I use cow’s milk? Is almond or coconut a better alternative? Dairy shouldn’t go in the Instant Pot, that’s why I use the non-dairy milks!